The Nature Conservancy’s office, 11304 N. Prairie Road, Lewistown. Did you know glaciers contributed to the formation of the Illinois River Valley? 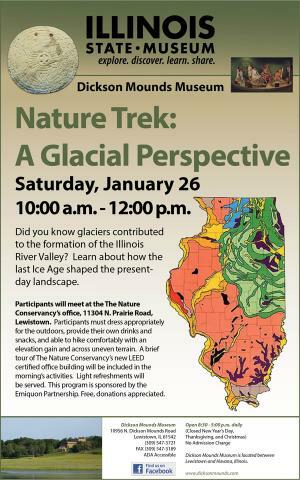 Learn about how the last Ice Age shaped the present-day landscape as you hike. Participants will meet at The Nature Conservancy’s office, 11304 N. Prairie Road, Lewistown. Participants must dress appropriately for the outdoors, provide their own drinks and snacks, and able to hike comfortably with an elevation gain and across uneven terrain. A brief tour of The Nature Conservancy’s new LEED certified office building will be included in the morning’s activities. Light refreshments will be served. *If the weather doesn’t permit a hike, Dr. Michael Wiant will present Illinois River Valley History: Ongoing Geological Research Provides New Information inside The Nature Conservancy's office building. This program is sponsored by the Emiquon Partnership.